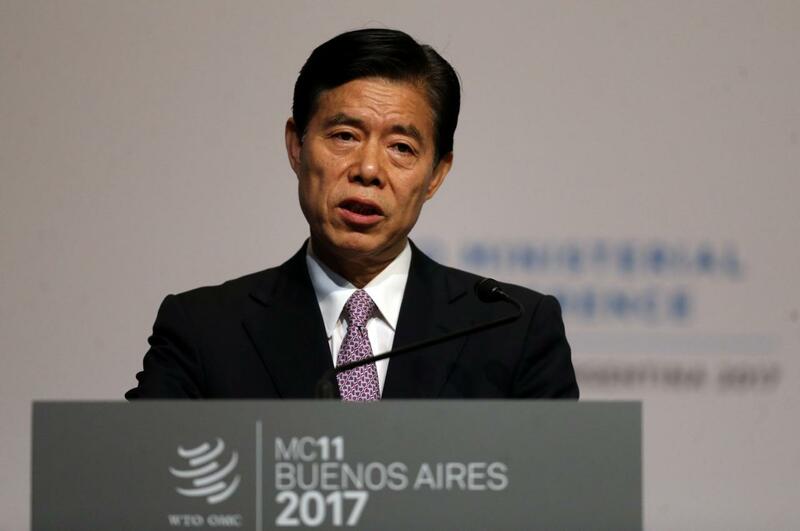 BEIJING (Reuters) – China will make it easier for foreign investors to access the country, protect their rights and ensure a fair and transparent investment environment, Trade Minister Zhong Shan said in comments published on Sunday. Foreign business groups in China have warned that foreign companies face an increasingly hostile environment in the country, and that Beijing’s policies and regulations unfairly favor domestic competitors. In October China’s National Development and Reform Commission (NDRC) launched the national program to promote “internet plus, artificial intelligence and the digital economy” and called for submissions. It accepted a first batch of 56 projects as qualified for its subsidies if there is no objection in the next week. Among the 56 projects are robot projects at Shenzhen UBTECH Robotics and Shandong-based Synthesis Electronic Technology, development of facial and voice recognition systems by Beijing Zhongdun Security Technology Development, CloudWalk Technology in Guangzhou and other two enterprises and some big data projects including the project of a China-Russia big data office in Harbin, a digital trade platform between China and the Association of Southeast Asian Nations, and an e-commerce platform between China and the Middle East. According to NDRC, the artificial intelligence projects chosen focus on mass production of smart chips, facial and voice recognition systems, drones, and advanced intelligent service robots. China is now blazing new trail in technology development instead of merely following US trend. Comment by Chan Kai Yee on SCMP’s report, full text of which can be found at http://www.scmp.com/news/china/economy/article/2126029/big-data-and-ai-projects-china-pinning-its-global-tech-ambitions. 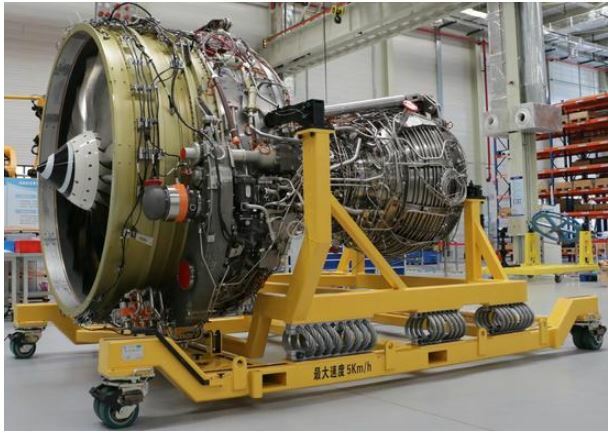 According to a report at the website of China’s Ministry of Industry and Information Technology, China has recently completed in Shanghai the assembly of a verification engine of its first homegrown CJ-1000AX turbofan. The engine consists of 35,000 parts, some of which are very difficult to make, for example the high hollow-rate wide chord fan of titanium alloy, the large thin aluminum alloy case for fan and the fuel nozzle for its combustion chamber made by 3D printing. Breakthroughs have been made in tackling the technologies through cooperation with 24 entities. The success making the verification engine lays foundation for verification tests of China’s civilian high bypass ratio engine for large airliners. China punishes dissident Wu Gan with 8-year imprisonment for criticizing Chinese government. The punishment is regarded as quite severe as he had only regularly championed sensitive cases of government abuses of power, both online and in street protests. However, he had not advocated replacement of China’ one-party autocracy with Western democracy. Compared with the 11-year imprisonment Liu Xiaobo received for issuing a document on the replacement and collecting the signatures of thousands of people supporting the document. The 8-year imprisonment Wu Gan has got is quite severe. Reuters says in its report “China chides U.S., German embassies after call for release of activist” on December 28 that the U.S. and German embassies issued a joint statement on December 27 to call for setting Wu free. China soon responded strongly. Its foreign ministry spokeswoman Hua Chunying said at a regular press conference that the two embassies had “no right to criticize what was purely an internal affair of China’s and a matter of China’s judicial sovereignty” and “We hope that the relevant diplomatic missions can take the correct position with regards to their own responsibilities.” She, in addition, pointed out that China is a country with rule of law and justice officials handled cases in line with the law. China says no so promptly and strongly as China now has self-confidence in its path, theory, system and culture as pointed out in Chinese Communist Party (CCP) General Secretary Xi Jinping’s speech to CCP 19th Congress. In the speech, Xi has set an ambitious goal for China to grow into a great socialist power by 2050. If China can keep its fast economic growth, by 2050 it will by far surpass the US and replace the US as number one in the world. US President Trump sees the potential replacement and wants US economy to grow faster but has encountered lots of obstacles. He has a tax reform approved by US Congress in order to boost US economy, but his policies may not be continued by his successor. At best, he can only be sure that his policies will last for 7 years if he can serve another term. China is an autocracy, Xi is sure that he can serve two more terms, choose a successor to carry on his efforts to attain the goal while he will remain in control after his retirement like Deng Xiaoping and Jiang Zemin. Therefore, China is very likely to maintain its fast economic growth to surpass the US before 2050. Trump’s predecessor Obama saw that and began to adopt his policy of pivot to Asia to contain China but failed. Now, the US adopts the Indo-Pacific strategy of quad to contain China, especially to hinder China’s Road and Belt plan, but quad is a military instead of economic strategy without being able to hinder China’s plan of win-win economic cooperation. China’s Belt and Road projects have been successfully carried out in Central Asia, Sri Lanka, Pakistan and Greece. With the win-win cooperation through its Belt and Road initiative, China will be able to maintain its relatively fast growth for the next two decades. China’s grand plans to divert water from Tibet to Xinjiang will enable it to develop its west vigorously so as to maintain fast growth for another 3 decades. As a result, there are satisfactory prospects for China to attain its ambitious goal. However, there may be serious setback. In the course of China’s strife to attain the goal, the US will try its best to hinder China’s efforts. That is the influence of Thucydides Trap. Due to the trap, Obama began his pivot to Asia to contain China, but he did not admit that the pivot aimed at dealing with China’s rise. Trump, however, says in his recent national security strategy openly that China is the most significant national security challenge among the five major threats from China, Russia, North Korea, Iran and Islamic terrorism. China is accused of being determined to control information and data to repress its society and expand its influence. That may refer to China’s censorship, restriction of freedom of press and speech and China’s human rights system different from Western ones. The strategy says that Trump’s doctrine is to promote individual liberty, rule of law, democratic governance, tolerance, and opportunity, which is in fact what the US has been doing for decades. It has resulted in the Tiananmen Protests, Liu Xiaobo’s Charter 08 manifesto for multi-party democracy and rights activists’ activities for human rights. China believes that such activities are instigated by the US to subvert Chinese Communist Party’s rule as the US regards promoting such activities as its doctrine. Unlike the US that is spreading its values including individual liberty, democracy and human rights system, China has declared that it does not export its model. However, The stronger and richer China grows, the more popular its model becomes among the large number of developing countries and the deeper the US sinks in Thucydides Trap. The US will enhance its efforts to support Chinese dissidents in the hope that they will disturb China’s progress. Therefore China is defensive instead of offensive in saying no to the West in order to prevent the emergence of another Tiananmen Protests that will hinder China’ efforts to attain its ambitious goal. As a result, China has tightened the screw in oppressing dissidents. However, I believe that it is not necessary as Xi has successfully fought rampant corruption, the major cause of Tiananmen Protests. The separatist Islamic terrorism is a much more serious danger that may give rise to panic throughout China and hinder China’s grand plan to develop its vast west. That will make it impossible for China to attain its ambitious goal. That is why Zhang Haitao is punished with 20-year imprisonment, much severer than Wu Gan. According to SCMP’s report “How questioning China’s security crackdown in Xinjiang led to a 20-year jail term”, Zhang questioned Xinjiang government’s policies and warned that government’s restriction on Uygurs’ religious practices may spark an insurgency only on the Internet. Unlike Wu Gan, he has not protested in the streets. China is wise to follow Deng Xiaoping’s instruction on giving priority to economic development. When it has attained the goal of building China into a great modern socialist country that is prosperous, strong, democratic, culturally advanced, harmonious, and beautiful by the middle of the century, there will be no problems of US containment, even less Taiwan independence. 1. China’s domestic disturbance caused mainly by dissents for Western democracy, press freedom, human rights, etc. China counters that with Xi Jinping Thought on Socialism with Chinese Characteristics on a New Year to infuse self-confidence in China’s path, system, theory and culture. It regards Western, especially American efforts to spread Western democracy and values such as press freedom and human rights as measures to subvert Chinese government. It, therefore, adopts harsh measures to suppress dissents. 709 crackdown was a typical example. 2. Riots for independence in Tibet, Xinjiang, etc., especially the Islamic terrorist attacks that may give rise to panic throughout China. That is why the US media supports Uygur separatists and describes Uygur terrorist attacks as something caused by Uygurs’ opposition to Chinese government’s restriction to their religious freedom. Taiwan independence may trigger such Chinese ethnic minority’s riots so that China absolutely disallows that. The situation now is that Taiwanese government is entirely unable to openly advocate independence due to lack of US support. If China takes Taiwan by force, the US may be involved but the US does not have any vital interests in Taiwan to justify a war for Taiwan against China. Though China is now strong enough to take Taiwan by force and though it is not likely that the US will fight a war with China for Taiwan, Chinese leaders shall be wise not to choose a military solution to the Taiwan issue as wise economic approaches are quite sufficient. In addition, economic approaches work well due to the stupidity of Taiwanese President Tsai Ing-wen. Chinese air force has carried out lots of patrols around Taiwan to give the false impression that China is making preparations for taking Taiwan by force. According to Reuters’ report yesterday titled “Taiwan president warns China against military aggression”, Tsai believes that China is going to take Taiwan by force so that she warns China against military aggression. What she says on the military tension precisely plays into China’s hands. She makes Taiwanese and foreign businessmen scared so that they dare not invest in Taiwan. Without injection of investments how can she reinvigorate Taiwan’s sagging economy? Moreover, she is stupid to increase Taiwan’s purchases of weapons for possible resistance against Chinese troops. She simply lacks the common sense that Taiwan cannot afford an arms race with China. She is depriving Taiwan of its limited financial resources for improvement of its economy. As a result she will be replaced by a pro-Beijing president. When that has happened, China will resume its preferential treatment to win over Taiwan. That is China’s carrot and stick approach. It will be much better than a military approach. Comment by Chan Kai Yee on Reuters’ report, full text of which can be viewed at https://www.reuters.com/article/us-taiwan-president/taiwan-president-warns-china-against-military-aggression-idUSKBN1EN0JU. BEIJING (Reuters) – China’s internet watchdog has ordered two top news feed sites to temporarily suspend parts of their platforms for broadcasting “vulgar” content and failing to implement censorship measures, amid tightening state control of what appears online. BEIJING (Reuters) – Beijing may have turned a corner in its battle against the city’s notorious smog, according to Reuters calculations, and environmental consultants say the Chinese government deserves much of the credit for introducing tough anti-pollution measures. The Chinese capital is set to record its biggest improvement in air quality in at least nine years, with a nearly 20 percent change for the better this year, based on average concentration levels of hazardous breathable particles known as PM2.5. The dramatic change, which has occurred across North China, is partly because of favorable weather conditions in the past three months but it also shows that the government’s strong-arm tactics have had an impact. The Reuters’ estimates show that average levels of the pollutants in the capital have fallen by about 35 percent from 2012 numbers, with nearly half the improvement this year. Government officials this week signaled they were confident they were starting to get on top of the problem. “The autumn and winter period is the most challenging part of the air pollution campaign. However, with the intensive efforts all departments have made, we believe the challenge is being successfully overcome,” Liu Youbin, spokesman for the Ministry of Environmental Protection, told reporters on Thursday. But environmental experts say that while they are optimistic, it may be too early to celebrate. And while China has scored an initial victory over smog, it still has to reverse public opinion outside China on its air quality. New York-based travel guidebook publisher Fodor’s advised tourists in mid-November in its ‘No List” for 2018 to shun Beijing until the city’s anti-pollution campaign had reduced the “overwhelming smog”. Fodor’s did not immediately respond to a request for comment. In Beijing there is certainly plenty of room for further progress as average air quality is still significantly worse than the World Health Organization’s recommendations. And the region still sees bouts of heavy smog. On Friday afternoon the U.S. embassy’s website said Beijing’s air was “very unhealthy” and the city issued a pollution alert on Thursday. The Reuters calculations showing the improvement were based on average hourly readings of PM2.5 concentrations at the United States Embassy in Beijing from April 8, 2008 to Dec. 28, 2017. The data was compiled from figures from the U.S. embassy’s air monitoring website, as well as data provided by AirVisual, a Beijing company that analyses air quality data. The data from the embassy, though not fully verified or validated, is the only set available for PM2.5 levels in the capital over that time period. AirVisual provided the hour-by-hour air pollution data from the embassy for recent months. Beijing’s air was actually worse in the first nine months of this year than in the same period last year, but PM2.5 concentrations from October to Dec. 28 this year were nearly 60 percent lower than last year, the Reuters figures show. Greenpeace climate and energy campaigner Huang Wei said that less than half of the improvement is due to favorable weather – particularly stronger northerly winds and low humidity – with the government’s policies behind most of the change. The Chinese government launched a winter smog “battleplan” in October for 28 northern cities that called for strict rules on emissions during the winter heating months when pollution typically worsens. The authorities also sought to make sure that Beijing wasn’t too polluted during October’s Communist Party congress, which is only held once every five years, at which Xi Jinping consolidated his power as the nation’s leader. Some of the more-polluting businesses in and around the capital were told to shut down for a period before and during the gathering. The plan for the winter months included switching millions of households and some industrial users to natural gas from coal for their heating and some other needs. There were also mandated cuts in steel production by up to 50 percent in some of the areas surrounding the city. Beijing’s improving air quality stands in stark contrast to India’s capital New Delhi, where pollution has steadily become worse over the past few years, and is now well above Beijing‘s. China’s improvement, and deterioration in some other countries, means China is now not among the ten worst countries for pollution in the world anymore, according to at least one measure. “At the national level, India tops the index rankings, followed by Bangladesh and Thailand,” said Richard Hewston, global head of environment and climate change at risk consultancy Verisk Maplecroft, which measures 198 countries for air quality. Beijing’s clean-air campaign hasn’t been without its challenges. The government this year botched the switch from coal to natural gas, leading to recent widespread shortages of gas, soaring liquefied natural gas prices, leaving some residents freezing in their homes and some factories shuttered. There is also a wider economic cost. Growth in industrial output, especially in northern China, has slowed because of the pollution crackdown, economists say, and the prices of some key commodities, from LNG to copper, have risen. Some of those who had been benefiting from the poor air quality by selling air filtration products have been taking a hit. “Overall demand in China is down… Some companies have 100 million yuan ($15.35 million) in unsold inventory this year as a result of the improved air quality,” said Liam Bates, CEO of Beijing-based Kaiterra, which makes air filters and air quality monitoring products. “We haven’t seen huge impact because we’re expanding heavily overseas. While the air in China is getting better, the air in India is much, much worse and we just opened our India office,” he said.